THE fourth group of pilgrims on a two-week Umrah in the holy cities of Makkah and Madinah under At-Taqwa Travel Tours returned safely to Brunei yesterday. The 84 pilgrims were welcomed by officers and staff members of At-Taqwa Travel Tours, who presented them with souvenirs on arrival at the Brunei International Airport. A Doa Selamat was also recited to bless the pilgrims. “This time, I made the trip to the holy land with my family, which made the experience even more memorable,” he said. He also expressed his gratitude to At-Taqwa Travel Tours for its efficient services and ensuring their welfare, while performing the Umrah. Throughout the religious tour, the fourth group of pilgrims was headed by Mohd Rakin bin Meludin, a Travel Consultant at At-Taqwa Travel Tours. 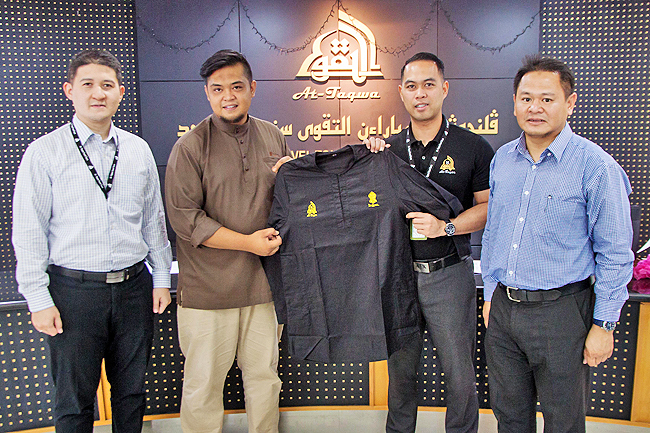 IBNU Anwari Collection, a local Muslim-wear brand, handed over 20 pieces of Kurta, the official attire for Umrah officers from At-Taqwa Travel Tours during the December Umrah pilgrimage. On hand to present the Kurtas was Faiyadih bin Haji Anuwari, Marketing Manager of the Ibnu Anwari Collection while representing At-Taqwa Travel Tours was the Chief Finance Officer, Awangku Mohd Naasiruddeen bin Pengiran Haji Yusoff. Also present were the Chief Operations Officers of At-Taqwa Travel Tours, Haji Shamsul Baharin bin Abdul Rahman, and agency’s Head of Department for Haj and Umrah, Pengiran Mohd Fakhrulrazi bin Pengiran Haji Omaralli. The handing over ceremony was held at At-Taqwa Travel Tours main office in Tungku Link yesterday. Logos of both companies are carefully embroidered on the Kurtas for easy identification. Chief Finance Officer of At-Taqwa Travel Tour extended his gratitude to Ibnu Anwari Collection for the collaboration and hoped to promote the brand to a larger market. Twenty Umrah officers from At-Taqwa Travel Tours will be deployed to ensure the safety and smooth operations for the pilgrims at the holy land. AT-TAQWA Travel Tours organised an Umrah practical workshop for a congregation of 400 umrah pilgrims who are part of At-Taqwa’s eight flight groups that will be flying to Makkah for Umrah this December. 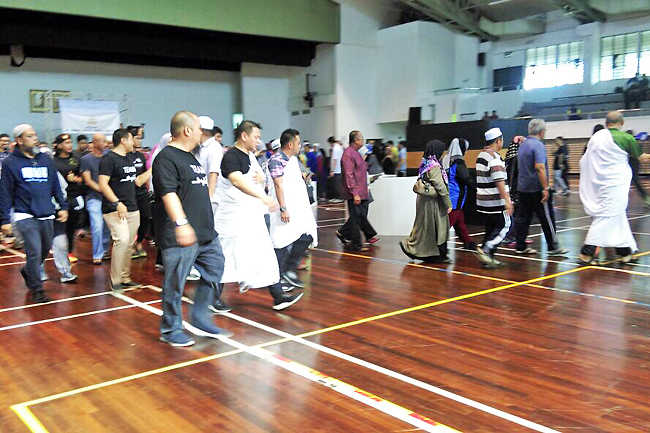 The workshop took place at the Multipurpose Hall of the Sungai Kebun Sports Complex yesterday. The workshop was held to prepare the pilgrims before the actual Umrah, seeing that some will be performing the Umrah for the first time. This initiative of organising a workshop for the Umrah is also a first by At-Taqwa as most workshops by other agencies are for the Haj season. The briefing and practical was led by Ustaz Haji Kahar bin Haji Ali, an officer from At-Taqwa, where a replica of the Kaabah was set up so the pilgrims could practice the Tawaf with more confidence. Also present at the workshop was the Managing Director of At-Taqwa, Pengiran Haji Rosdimar bin Pengiran Haji Omarali. AT-TAQWA Travel Tours Sdn Bhd recently hosted an Umrah talk for 400 Umrah pilgrims participating in the At-Taqwa Umrah Group 2017 package in December. Presenting the welcoming speech was Pengiran Haji Rosdimar bin Pengiran Haji Omarali, the Managing Director of At-Taqwa Travel Tours, followed by a series of talks by various speakers including Awangku Mohd Nassiruddeen bin Pengiran Haji Yussof, the Chief Financial Officer; Haji Shamsul Bahrin bin Haji Abdul Rahman, the Chief Operating Officer whose talk touched upon preparation and expectations for the Umrah journey; Ustaz Khairul Nazif bin Haji Damit, assistant lecturer from Universiti Islam Sultan Sharif Ali; and Ahmad Munadi, an officer from Takaful Brunei Am Sdn Bhd. The talk continued with a question-and-answer session and concluded with a presentation of At-Taqwa souvenirs to the participants. 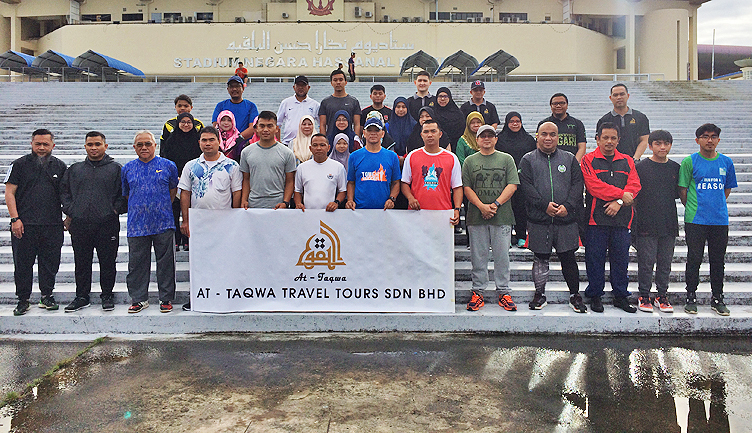 AT-TAQWA Travel Tours Sdn Bhd organised a brisk walk activity with two of its December Umrah package groups at the running trail in front of the Hassanal Bolkiah National Stadium in Berakas recently. The activity aimed to mentally and physically prepare the pilgrims for the Umrah where they will perform the Sa’ie and travel seven trips from Safa to Marwah, at Masjidil Haram, Makkah, which will be around three kilometres. It also sought to introduce the pilgrims to the officers of At-Taqwa who will be guiding and facilitating the pilgrims during their Umrah. The two groups are among the eight Umrah package groups that will be flying to the Kingdom of Saudi Arabia for the pilgrimage in December. 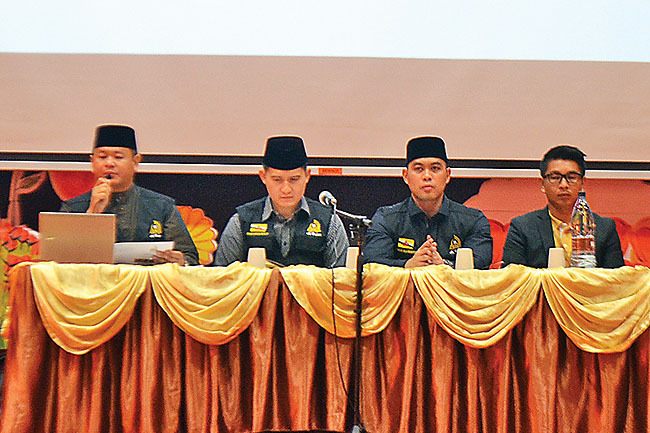 Awangku Mohd Naasiruddeen bin Pengiran Haji Yusoff, Chief Finance Officer at At-Taqwa Travel Tours, in an interview with the Sunday Bulletin said it is the first travel agent, to organise a recreational activity to prepare pilgrims.